This file may take a few moments to download. The Puppydogs' Walk is scored for Oboe, Bb Clarinet, Bassoon, Piano accompaniment and optional percussion (sound effects). It was written in October 2002. Three puppydogs going for a walk. Imagine the excitement. Theres tail wagging, looking cute, big padding feet pulling eagerly at the leads and lots of sniffing, scratching and barking. 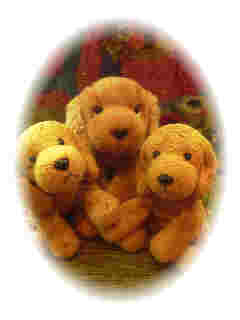 The three dogs are identified by the three differently pitched solo instruments, aided by the three different barks. The piano part  the owner - gives the feeling of walking, and at times being pulled along. The staccato playing action helps especially in this respect. The percussion is optional, for the piece works without it. But it is more fun with the sound effects, which can be achieved with a keyboard that has a dog-bark sound. The yaps are pitched higher than the woofs, and the woofs higher than the ruffs. For the sniffing, try a reverse snare sound, and for the scratching, maracas. The scream is a woman frightened by the dogs as she comes around a corner. This is very optional, but I found the sound effect on my keyboard  or a recording could be used for a performance.